I like the image of the wandering pilgrim/scholar who finally reached the horizon separating the flat earth from the dome of the sky, and then had the courage to break through and look at the other side. In my embroidery I alluded to what I consider the two most important questions he could ask… why, and why not… or Y and Y*. These are metaphysical. The questions of who, where, what and when are usually answerable by research, by the accumulation of information. But Y and Y* require us to look at causation and purpose. As I anticipated, the response to Doorway to Discovery was underwhelming. The winning challenge selection was a really cute and well executed applique hanging showing a frenzied quilter pushing against a closet door from which pieces of fabric were exploding. But I didn’t enter the competition anticipating to win. The theme of doors sparked my imagination, and I did it for myself. As I brainstormed topics of really interesting doors, I thought of the discovery of the entrance to King Tut’s tomb; and then that reminded me of seeing the Tut treasures years ago at the The Royal Ontario Museum in Toronto, and on to photos of the amazing addition to that building. I shall start an abstract piece on that soon. The architecture, and its connection to the elegant old original building stirred considerable controversy. I loved the old museum, especially for the crowded old-fashioned displays of very large collections of related items, the armor court, the temple court, the dioramas of taxidermy animals and insects, the dinosaurs, the live snakes in aquaria, the temple garden. I knew exactly where to go to visit my favourite things, and the list grew longer with every visit. There was an enormous model of the parthenon, like a huge dollhouse, with the statue of Athena, and a painted frieze around the room. And a tapestry of Adam and Eve, and a real mummy, and tiny little Chinese bottles, and crystals … and… and. This has all changed, replaced by artistically curated displays. But isn’t this amazing, too? 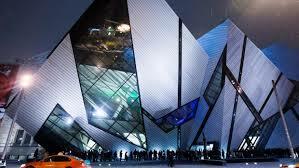 This is a time-lapse of Michael Lee-Chin’s Crystal addition to the Royal Ontario Museum (ROM). The period covered is from May 2003 to opening night in November 2007, through a series of still images captured daily at 1 pm during construction and at 10-minute intervals throughout opening week. 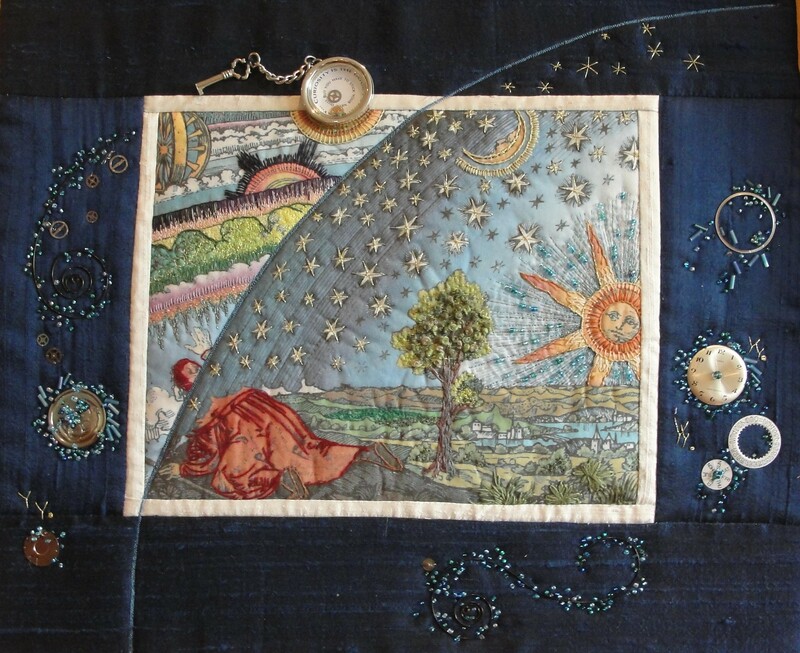 This entry was posted in Uncategorized and tagged art, choice, creativity, embroidery, Ontario, technology. Bookmark the permalink. I enjoyed and admired your piece. Great use of the Timex. Go steam punk.